Hello... It's been a while, hasn't it. They say it takes a village to raise a child but I think the same applies to many other things. Like how the past couple of weeks has taught me that it does indeed take a village and a half to get your friends married off successfully. I will think again, very carefully, before I play match-maker and set up two friends lest I endure the back-breaking labour of being a bridesmaid all over again. Of course, I only quip about the taxing effort that goes into helping a friend plan a wedding, it's no doubt laborious but being a bridesmaid for a precious friend is always a barrel of laughs and I wouldn't trade all the tuile and chiffon in the world for it. But now that all the festivities are done and dusted, all that is left to do is catch up on much needed sleep and get back into the routine of normal life- with say normal thngs like blogging. Yes, the fact that I had a blog completely eluded me all this time while I was up to my knees in questions like "Is this green too green, or does this pink look like a dusty rose, or a vintage rose?" And all you had to tide you over with, all this time was a post on my mediocre madeleines that stunk of feet. I'm sorry. 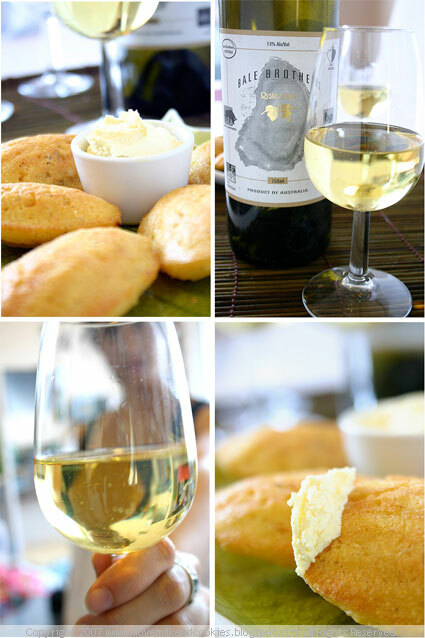 I did promise a madeleine recipe to follow that wasn't so odourous and rank as the ones before and here it is. 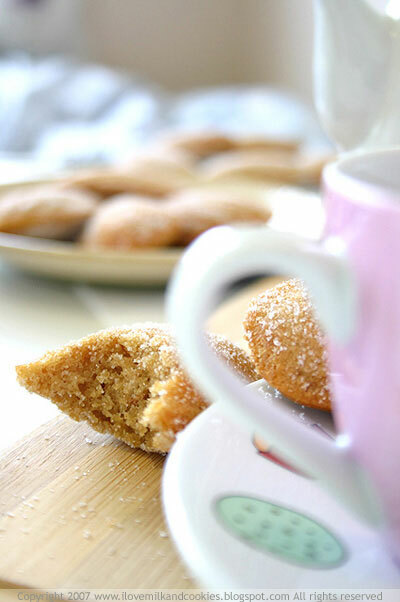 I made these a while back as an attempt at re-creating the apple and cinnamon madeleines I tried at the markets by Manna From Heaven- an Australian handmade biscuit company that believes in using only quality ingredients. 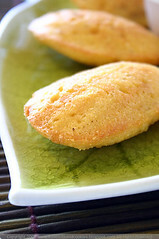 To this day I am still yet to taste a better madeleine. They are extremely moist and delicately sweet and smell incredibly unlike feet! 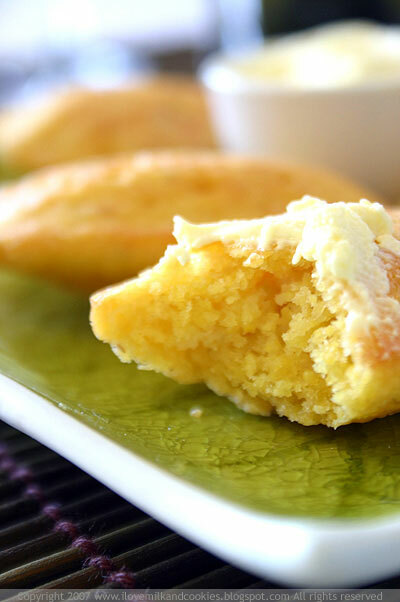 Manna From Heaven only make these madeleines in limited numbers and only during autumn/winter. So you have to be quick to catch them or else they are pretty much gone before you have enough time to take a whiff. 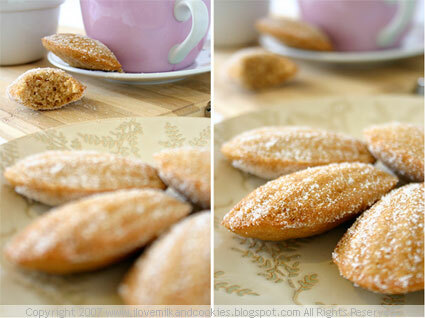 I don't know exactly how Rachel- MFH's founder, gets the madelines to be so moist, but they are incredibly irresistible. 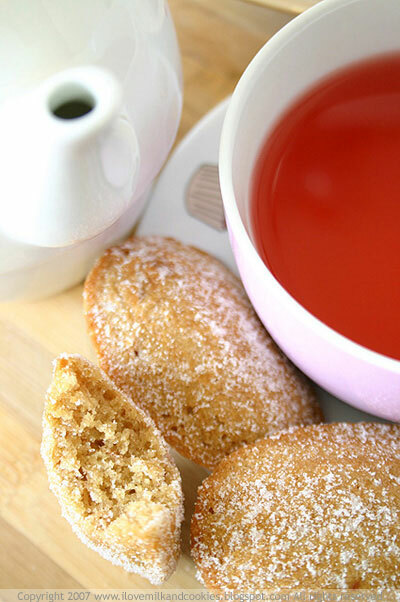 From what I gather, traditionally, madeleines are quite dry cakes and are made moist when dipped into or eaten with tea. 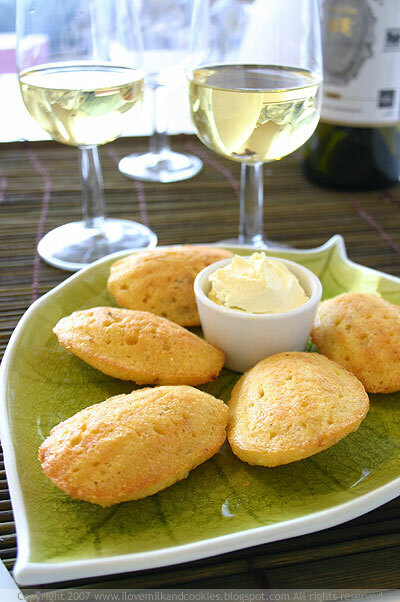 An example of what I would say are traditional madeleines are Adriano Zumbo's madeleines which almost demands you to have a drink ready in your hand before you choke on the little cakes that stick to the roof of your mouth. 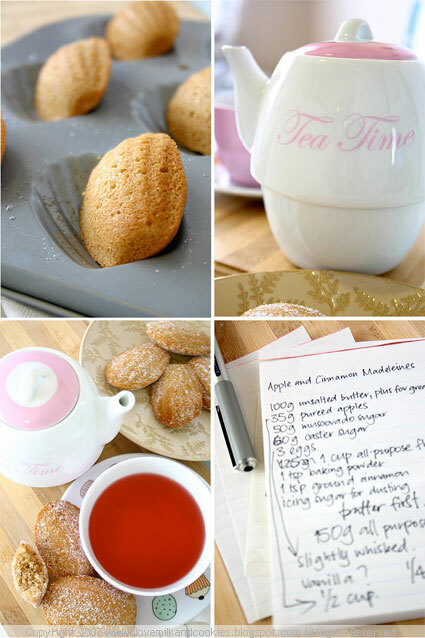 I would have to say that Manna From Heaven's apple and cinnamon madeleines are a welcome departure from the traditional. Although Adriano Zumbo's madeleines, and pretty much everything else in the Balmain store are nothing short of a masterpiece, but when you don't have a spare drink lying around I would probably opt for the moister kind. I have to say that re-creating a recipe from memory is not an easy thing. 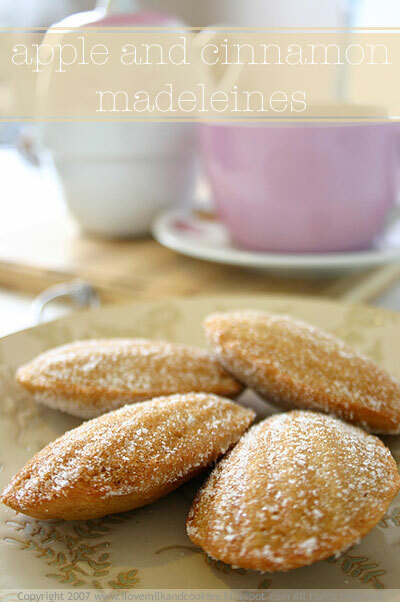 I pulled together all my madeleine recipes and tried to build my own using the techniques and measurements from them all. My version of the apple and cinnamon madeleines is nothing near the exquisiteness of Manna From Heaven's, although it is still delicious. Slightly moist and aromatic, there is nothing better for an afternoon snack. Next time, I might try using a little bit more melted butter and apple puree to get a wetter batter. I am not sure if this will work, but baking in the name of research isn't such a bad thing, is it? 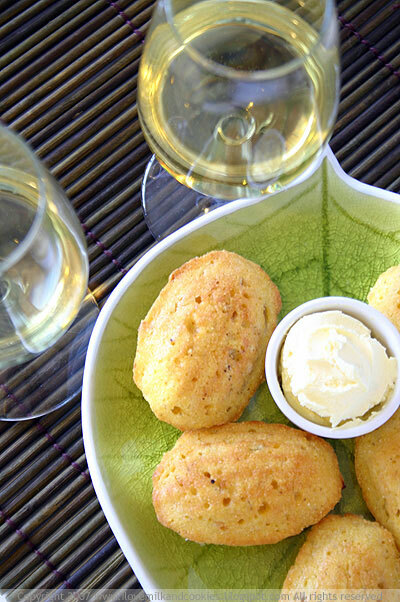 Brush madeleine moulds with butter. In a small bowl sift together flour, baking powder and ground cinnamon, set aside. Cream butter and sugars in another bowl until light and creamy. Add eggs and apple puree and beat until combined. Sift in flour mixture and fold until the flour has been incorporated into the wet mixture. Place a heaped teaspoonful of the mixture in each mould and bake for 8-10 minutes or until the tops are golden. Remove from oven and cool for 5 minutes in tray. 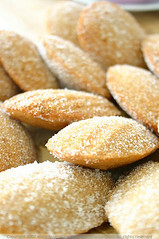 Unmould and lightly coat madeleines with granulated sugar. 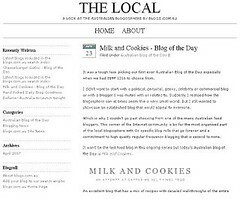 I had a really late night getting up to all sorts of shenanigans in the city last night and then fell out of bed this morning, correction- afternoon, to find that there was an article today in the Technology section of news.com.au about the Ausssie blogs nominated for the 2008 Bloggies, which happens to include this blog. It was actually quite amusing, seeing as I rate myself as one of the least technologically savvy people on the Internet. This blog is held together through sheer providence and a lot of guesstimation; let's just say if the blog were to manifest itself in the real world, it would be held together with a glue gun and a lot of paddle pop sticks. But it is nice to be mentioned amongst the other illustrious nominees, who run some of the most popular and articulate blogs in the country. And then I also found out that I had come first place in last month's DMBLGIT hosted by The Food Traveller. 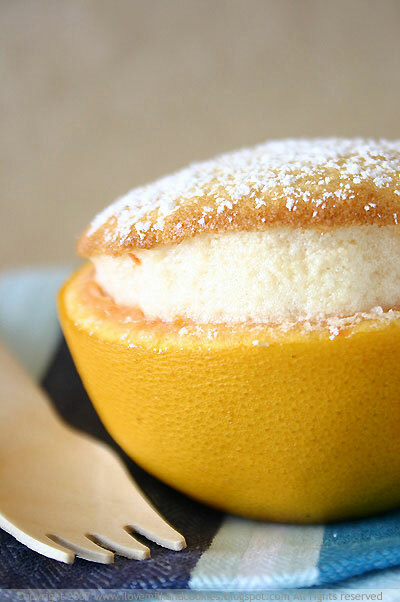 The photo is of grapefruit soufflés that I baked in its own skins. 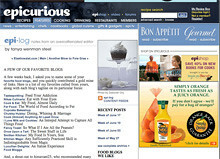 The recipe is here is you are interested. Wow, I am definitely feeling the love right now and I'm hoping it won't come back to bite me in the you know what. All I can say is that I appreciate all the applause and certainly hope I won't turn into a one trick pony and will endeavour to keep the blog looking pretty and sounding fresh for you all. This blog is brought to you by... a monkey...? I've been blogging for sometime now and it never occurred to me until recently that I have never formally introduced myself. You know the fundamentals- who I am, where I'm from and that I have a penchant for anything sugary. But that's really about it. The web can be a good buffer between you and the real world and as much as I would like to remain an enigma, that dark horse, mysteriously blogging from her unassuming little corner of the world, I thought that it would be nice to actually introduce myself properly and break the ice. I'm a Jennifer, but it's usually Jen or Jenni that i'll answer to. You might even find that I will respond to "hey you" or "oi! ", I'm really not that fussy. 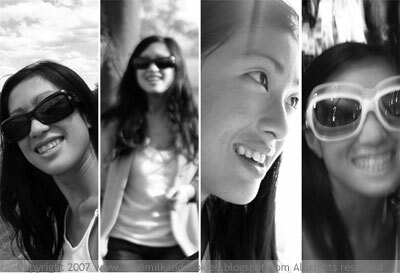 I was born in Manila Philippines, but now am a naturalised Aussie, since I was 6 years old. I call Sydney home, although right now I am living in London, United Kingdom. As that Peter Allen song suggests, I still do call Australia home and no matter where I am, I always wish I was back home in Sydney. The land of (seeming) eternal sunshine and BBQ's, where thongs are worn on your feet not on your derriere and the public holiday is a sacred institution, as much as beer and sport. 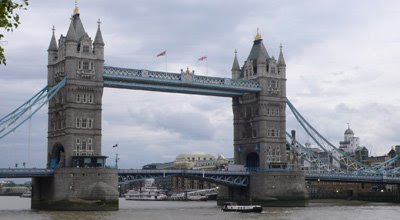 London is my home for the time being, but Australia is always going to be a great place to live and if you are ever here in Sydney for a visit, make sure you give me a holler. 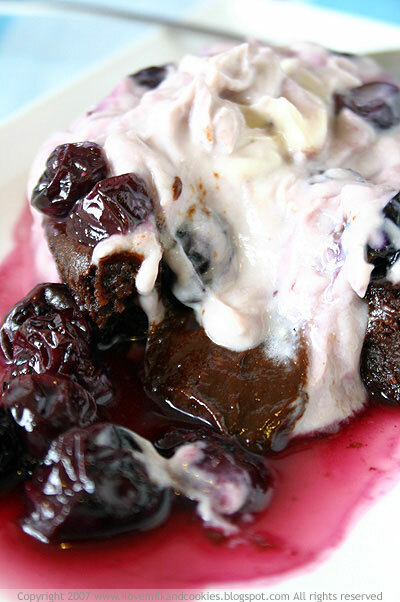 Here are a few recommendations on where to visit, foodwise. Fine Dining- Tetsuya's, Aria's, Becasse and Astral to name a number of world class dining places. Quintessential Sydney- Harry's Pies for a late night bite, North Bondi Italian for the signature Sydney view, Sydney Fish Market to sample the finest seafood Sydney has to offer or Doyles at Watson's Bay for that stunning view of the harbour. Thai- Chat Thai in Haymarket, Spice I Am in Surry Hills, Sailor's Thai at The Rocks. Bakeries/Pastries- Bourke St Bakery in Surry Hills, Adriano Zumbo and Victoire in Balmain, Brasserie Bread in Botany Bay, Epi d'Or in Kirribilli and La Gerbe d'Or in Paddington's Five Ways. Chinatown- check out everything it has to offer and cross over George St and venture into what's is now affectionately coined as Thainatown. Red Light District Bites- Hernandez Cafe for the coffee and the bohemian atmosphere, Burgerfuel for gourmet burgers and live it up with the young, hip and happening at Favela, The Lincoln and Dean's Cafe. Juju's for some late night karaoke and immersion into Japanese culture. There's also Guzman Y Gomez, which isn't your regular Taco Bell. Venture down Darlinghurst Rd and you will stumble across gems like sushi happy hour at Zushi and a barrage of tiny cafes, all good. Breakfast- Fifi Foveaux and Bill's in Surry Hills, an early morning bite and a walk afterwards from Bronte Beach, Campos Coffee at Newtown, Brasserie Bread if you are in the area, Sonoma Bakery in Glebe. Just to name some off the top of my head. WHY THE PRIMATE ALTER EGO? Most of you think I look like a chimpanzee and I don't blame you. My profile picture looks a lot like a chimp. But it's not what you think. I am not hiding behind this furry face because I think I look like a hideous beast and couldn't bear showing my face in in public. Frankly, I didn't know if this blog was going to be any good, so it was easier to go ahead with blogging and risk shame, failure and my ego knowing I had this monkey façade to hide behind. The web can be a mean place, and there are a lot of crazy people out there that pick on you for no reason. 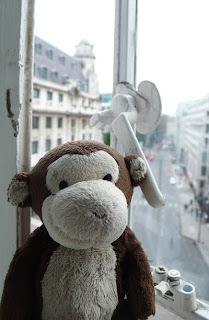 I thought having a monkey front this blog would deter people people from being too unkind. And besides if you catch yourself abusing an innocent monkey you might want to think twice about what kind of person you really are. Look at him, how could you ever be cruel to that face? How? Now that the food blogging scene has proved less intimidating as I thought it would be, It's high time for me to finally emerge from my cover. And it doesn't seem so bad to be out in the open. 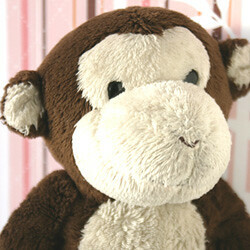 But, I do still prefer to keep my monkey frontage, just because he's a little easier on the eyes. Just look at him there, looking so jet-settingly cool in his swanky London hotel room. Hmm, that's a good question. I kind of fell into this blogging this unassumingly. I decided to start a blog without knowing anything about it and a year and a bit later, here I am still baking. I guess, I always wanted to write and never had an outlet, I always loved taking photographs although never had a chance to showcase them, and always wanted to cook but never had the courage. I guess this blog just became the perfect conduit to house all those passions. And I guess, it was the perfect way to indulge all of these hobbies anonymously, until I could safely come out, so to speak. And besides all that, all evidence suggests that I am Asian and female, which are two very strong factors that basically predetermine that I must blog about food. Funny that, I never thought of myself as fitting into a stereotype but there it is, a female Asian food blogger- the perfect demographic for the discourse of food online. I am completely self-taught, with absolutely no formal training. And I say it often and I'll say it again- that sometimes my amateur-dom does show. I don't have a fancy camera, or a fancy lighting kit, my "studio" is my bedroom, which houses a makeshift area in which I take all my food photos, amongst all my clothes, shoes and dirty laundry- tres chic! I inherited an old SLR film camera from my dad when I was 17 and basically taught myself how to use it. So it slightly amuses me when people email and ask for photography tips because I feel so inadequate. Currently I am using a Canon EOS 300D SLR digital camera. Because I am a cheapskate, I only have the lens that came with the camera which is an EF18-55mm 3.5-5.6f Canon Zoom lens. It does the job for now, but I am planning to buy a 50mm 1.4f USM Canon lens, which will give me better bokeh and in general, prettier pictures. I got stitches in my head when I was 4 after an accident in the bathroom. I used to be terrified of swimming in large bodies of water. I get adverse reactions to insect bites and eating melons. Ignorant and stupid people along with dictators and terrorists aggravate me. I've never won a running race but beat a bunch of boys at Tekken on Playstation (Score:20-8). Nintendo Wii is my next frontier. Am tone deaf, but very skilled at the triangle, tambourine and egg shaker. Prefer to drive a manual (stick) than automatic. I have a dog named Jack who is a constant source of laughter. He loves cockroaches and ladies perfume. 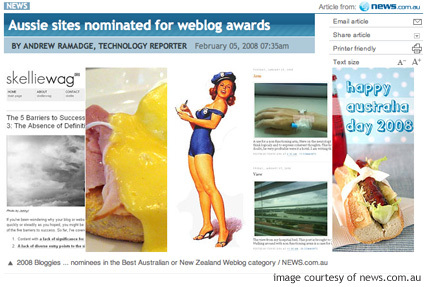 I don't know how long this zeal for blogging will go on for, but right now that desire is still raging. I will only continue to do it as long as I am loving it. So if my gusto for it will ever start to wane, then I will probably have to retire or take a short hiatus and get my bearings back. With the weather dithering between sunshine and rain, it's hard to know what kind of meal to go with. Shall I go for something heavy to blubber-up for the cold or do I go for something light and refreshing? It's the same kind of dilemma when you go out- should I bring a cardigan or will I regret having to carry it in my already stuffed bag, ten blocks away from the car? Sometimes you just have to put your money on the fact that although it's mid-summer, it's probably going to rain. According to the bureau of meteorology, the east cost is currently experiencing the La niña weather phenomenon, which basically means that it's going to rain- a lot. And it has. On the bright side, at least I don't have to worry about the lawn going brown or having to wash my car so often. So this La niña thing isn't all doom and gloom- it has its ups. So when the outside is just too disagreeable to contend with- like earth shattering claps of thunder, stray bolts of lightning that could possibly strike you at any time and a wall of rain that's falling sideways, it's best to stay indoors and let nature's fury pass. And while passing the time indoors, I decided to make use of all those spare hours by making a chocolate tortini- a soft-centred chocolate tortini to be exact. 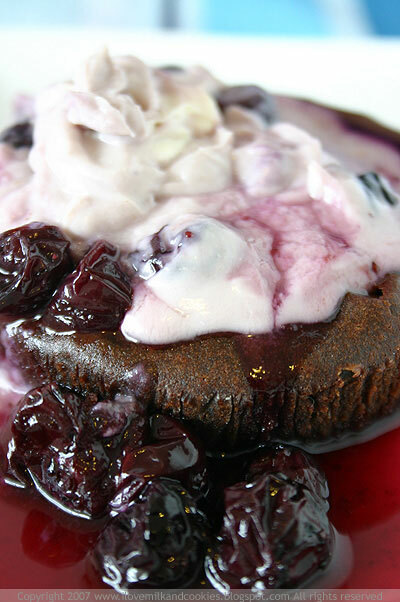 The recipe is from chef Luke Latimer of Onesta Cucina in Bowral, which is in country NSW. I found the recipe in the Australian Gourmet Traveller accompanied by one of those really enticing photographs, worthy of a magazine cover that lure you into buying the thing and then makes you crave the dish so much that you would give up your first-born for a taste. Luckily I have no offspring of my own. But what I could possibly give up is a perfectly sunny day in exchange for one chocolate tortini, topped with all sorts of sweet and creamy condiments that will make your dietician shudder. The dish is almost in danger of bordering on being too good. 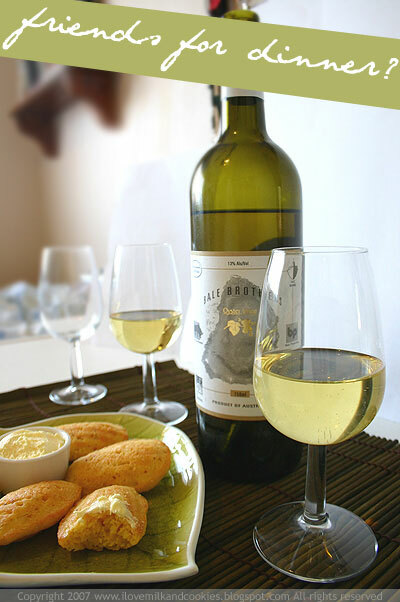 And what is great is that the recipe is designed for when you have time to wile away. This is exactly what rainy days are made for, sitting around and wasting away the hours, probably in front of the television or with a good book. And if you are too self-righteous to admit to loving those lazy days then that's just too bad. Doing nothing is tons fun. The original recipe calls for a raspberry sauce although I was all out of raspberries and in this rain, I wasn't going to venture out berry-picking; I was all stocked up on blueberries though, so I decided to create a port-based blueberry sauce to go with the tortinis instead. 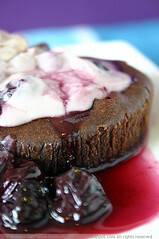 The result is a gorgeous deep mulberry-coloured syrup that is the perfect accompaniment to the richness of the tortini. The tortinis are under-baked intentionally so that the centres remain soft and when you cut into one of them, the lovely dark-brown centre oozes out from the middle. It's artwork in motion. You can also top the tortinis with a dollop of cream, however I decided to use mascarpone because that's what I had lying around. 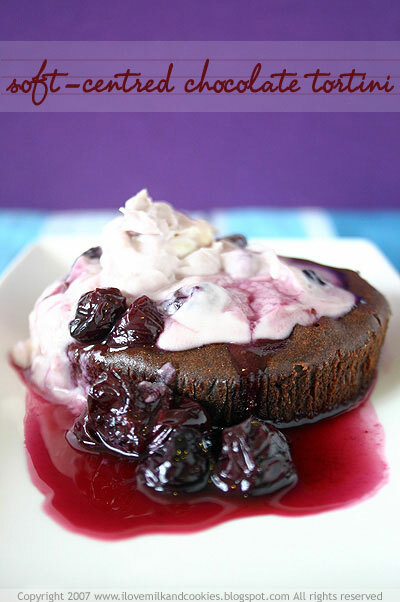 I know it sounds extremely pretentious in that snobishly foodie sort of way, but I would recommend only using high quality chocolate for this dessert, as you probably would for most desserts because you will definitely taste the difference in the end. In this case, compound chocolate just won't do. Actually I wouldn't even recommend using compound chocolate in anything as it lacks the complex flavours that true chocolate has. So is that uppity enough for you? If and when there's another rainy day to give you all the time in the world, head over to the Monthyly Mingle at What's For Lunch Honey. There will be a great selection of comfort foods that will see you through a rainy day and then some. Melt chocolate and butter in a heatproof bowl over a saucepan of gently simmering water, stir to combine and cool. Using an electric mixer, beat eggs, yolks and sugar for 8 minutes or until thick and creamy. Gradually add flour and whisk to combine, then add chocolate mixture and whisk for another 5 minutes. Divide mixture between 6 lightly greased and floured 10cm-diameter round pie tins, place on an oven tray and refrigerate for 1 hour. Bake tortini for 10-12 minutes or until they are firm but their centres are soft. To serve, remove tortini carefully from pie tins and place on plates, top with a scoop of mascarpone, drizzle with blueberry sauce and serve immediately. 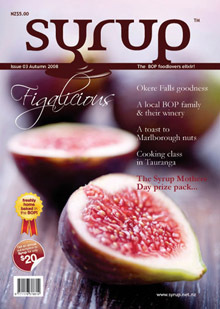 Combine port, water, sugar, vanilla and lemon zest in a medium saucepan and bring to the boil. 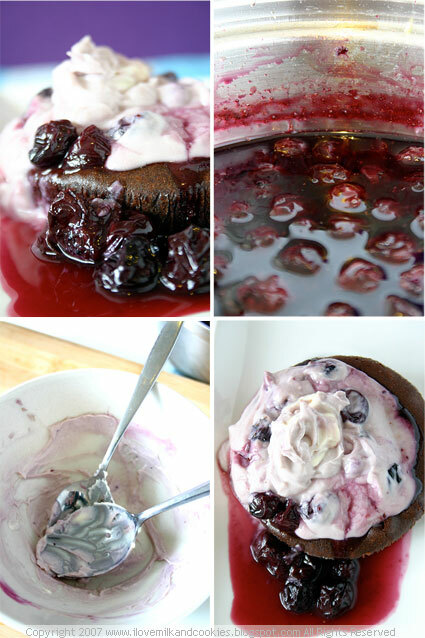 Add the blueberries and reduce heat and leave to simmer for 15-20 minutes until the liquid becomes syrupy.